I have beautiful, soulful eyes and a tremendous heritage as a faithful hunting companion. 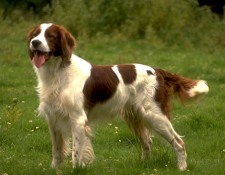 I am also the oldest of all the setter breeds. I am qualified as either a setter or a retriever, willing and eager to enter water when necessary. My coat is relatively easy to care for. I enjoy living outside the city where I have things to inspect and lots of space to play and run. When fully grown, I am between 24.5 and 27 inches tall (62.2 to 68.6 centimeters) and I weigh between 40 and 71 pounds (18 to 32 kilograms). We have no English Setter Breeders listed at this time. Click here to place your English Setter Ad!